Substation ventilation is generally required to dissipate the heat produced by transformers and to allow drying after particularly wet or humid periods. However, a number of studies have shown that excessive ventilation can drastically increase condensation. Ventilation should therefore be kept to the minimum level required. Furthermore, ventilation should never generate sudden temperature variations that can cause the dew point to be reached. For this reason: Natural ventilation should be used whenever possible. 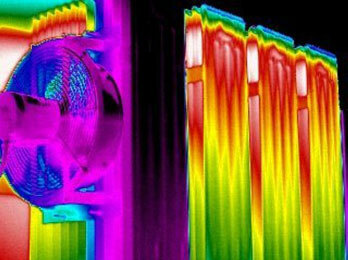 If forced ventilation is necessary, the fans should operate continuously to avoid temperature fluctuations. Guidelines for sizing the air entry and exit openings of substations are presented hereafter. A number of calculation methods are available to estimate the required size of substation ventilation openings, either for the design of new substations or the adaptation of existing substations for which condensation problems have occurred. This formula is valid for a yearly average temperature of 20 °C and a maximum altitude of 1,000 m.
It must be noted that these formulas are able to determine only one order of magnitude of the sections S and S’, which are qualified as thermal section, i.e. fully open and just necessary to evacuate the thermal energy generated inside the MV/LV substation. The pratical sections are of course larger according ot the adopted technological solution. and on some physical and environmental parameters: outside ambient temperature, altitude, magnitude of the resulting temperature rise. The understanding and the optimization of the attached physical phenomena are subject to precise flow studies, based on the fluid dynamics laws, and realized with specific analytic software. 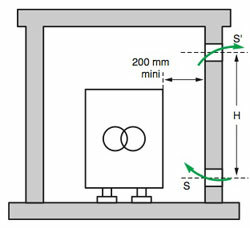 Transformer dissipation = 7,970 W LV switchgear dissipation = 750 W MV switchgear dissipation = 300 W The height between ventilation opening mid-points is 1.5 m.
To favour evacuation of the heat produced by the transformer via natural convection, ventilation openings should be located at the top and bottom of the wall near the transformer. The heat dissipated by the MV switchboard is negligible. To avoid condensation problems, the substation ventilation openings should be located as far as possible from the switchboard. «Over» ventilated MV/LV Substation. The MV cubicle is subjected to sudden temperature variations. Substation with adapted ventilation. The MV cubicle is no longer subjected to sudden temperature variations. If the MV switchboard is separated from the transformer, the room containing the switchboard requires only minimal ventilation to allow drying of any humidity that may enter the room. To reduce the entry of dust, pollution, mist, etc., the substation ventilation openings should be equipped with chevron-blade baffles. Always make sure the baffles are oriented in the right direction. Any need for natural ventilation is taken into account by the manufacturer in the design of MV cubicles. Ventilation openings should never be added to the original design.